N e w s Fr o m H Q Huerta Conﬁrmed as FAA Administrator Michael Huerta was conﬁrmed as FAA administrator for a ﬁve-year term in early January, ending his one year of service as acting administrator. 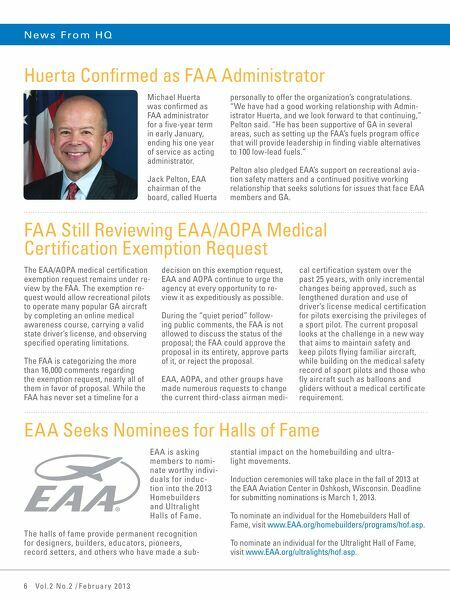 Jack Pelton, EAA chairman of the board, called Huerta personally to offer the organization's congratulations. "We have had a good working relationship with Administrator Huerta, and we look forward to that continuing," Pelton said. "He has been supportive of GA in several areas, such as setting up the FAA's fuels program ofﬁce that will provide leadership in ﬁnding viable alternatives to 100 low-lead fuels." Pelton also pledged EAA's support on recreational aviation safety matters and a continued positive working relationship that seeks solutions for issues that face EAA members and GA. FAA Still Reviewing EAA/AOPA Medical Certiﬁcation Exemption Request The EAA/AOPA medical certiﬁcation exemption request remains under review by the FAA. The exemption request would allow recreational pilots to operate many popular GA aircraft by completing an online medical awareness course, carrying a valid state driver's license, and observing speciﬁed operating limitations. The FAA is categorizing the more than 16,000 comments regarding the exemption request, nearly all of them in favor of proposal. 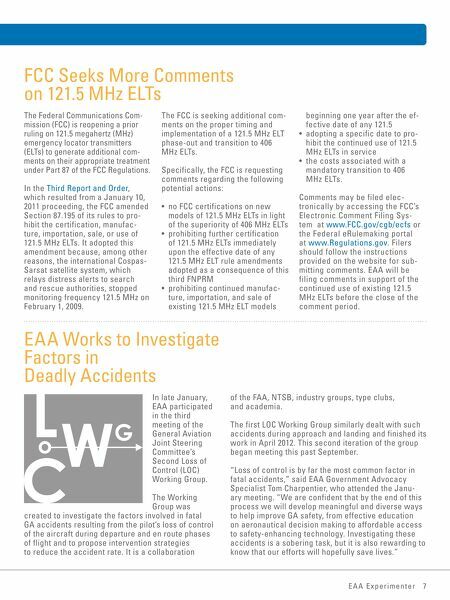 While the FAA has never set a timeline for a decision on this exemption request, EAA and AOPA continue to urge the agency at every opportunity to review it as expeditiously as possible. During the "quiet period" following public comments, the FAA is not allowed to discuss the status of the proposal; the FAA could approve the proposal in its entirety, approve parts of it, or reject the proposal. EAA, AOPA, and other groups have made numerous requests to change the current third-class airman medi- cal certification system over the past 25 years, with only incremental changes being approved, such as lengthened duration and use of driver's license medical certification for pilots exercising the privileges of a sport pilot. The current proposal looks at the challenge in a new way that aims to maintain safety and keep pilots flying familiar aircraft, while building on the medical safety record of sport pilots and those who fly aircraft such as balloons and gliders without a medical certificate requirement. EAA Seeks Nominees for Halls of Fame EAA is asking members to nominate worthy individuals for induction into the 2013 Homebuilders and Ultralight Halls of Fame. The halls of fame provide permanent recognition for designers, builders, educators, pioneers, record setters, and others who have made a sub- 6 Vol.2 No.2 / February 20 13 stantial impact on the homebuilding and ultralight movements. Induction ceremonies will take place in the fall of 2013 at the EAA Aviation Center in Oshkosh, Wisconsin. Deadline for submitting nominations is March 1, 2013. To nominate an individual for the Homebuilders Hall of Fame, visit www.EAA.org/homebuilders/programs/hof.asp. To nominate an individual for the Ultralight Hall of Fame, visit www.EAA.org/ultralights/hof.asp.